I just picked up the My Favorite Things Snuggle Bunnies stamp set! So very happy that my local store received this set! I am just waiting for the dies that go with these SWEET images! I started with a panel of Canson Watercolor paper and used a mix of Weathered Wood, Iced Spruce and just a hint of Stormy Sky Distress inks for my background. I sprayed the panel with my Distress Sprayer which gave that stormy sky effect. I then die cut another panel of the same cardstock for the hills and water. Also used Distress for both, Antique Linen, Gathered Twigs and a bit of Ground Espresso for the "beach" and Tumbled Glass and a touch of Salty Ocean for the water. 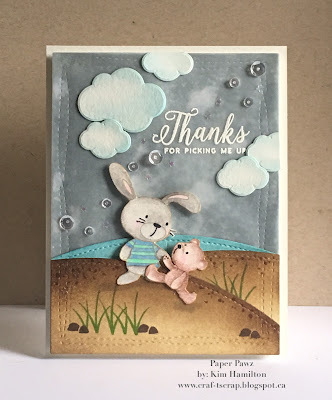 I stamped my images from Snuggle Bunny with MFT Hybrid Kraft ink and used my Prismacolor pencils and Gambol to colour them in and added some black to emphasize part of the images then I fussy cut them. I decided to mute the background a little by die cutting a vellum panel and I die cut some Lawn Fawn clouds. 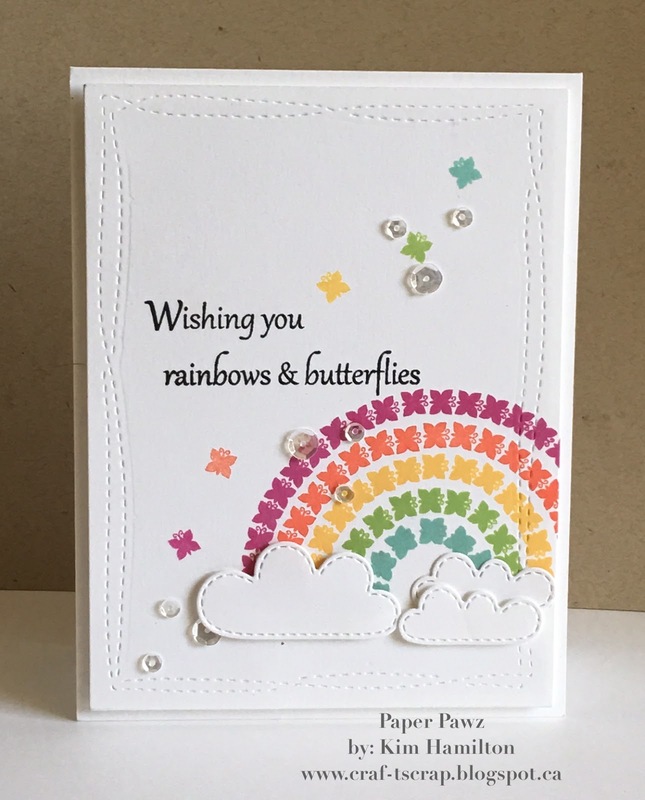 The sentiment was embossed in white and is by Mama Elephant. The rocks and leaves are by Lawn Fawn. 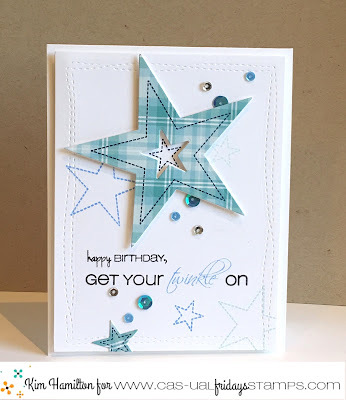 A sprinkle of stars and sequins finish off the design. I am so enjoying the Hero Arts Layering stamps! I picked up this Flamingo -- I mean who could resist! 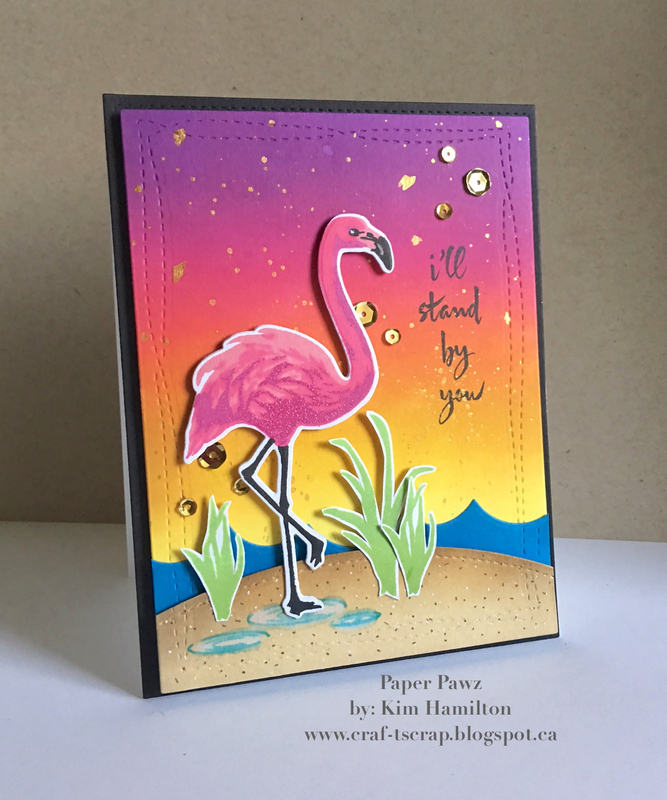 I used my Misti stamp tool for the Flamingo with Hero Arts Soft Blossom ink (base), Lawn Fawn Pink Flamingo for the second layer and Simon Says Stamp Doll Pink for the last layer. I stamped the last layer once more in versa mark and added some clear embossing powder, the effect is difficult to see in the picture but what a nice raised finishing touch. For my background, I used Distress Inks in Wilted Violet, Picked Raspberry, Abandoned Coral, Fossilized Amber and Squeezed Lemonade. I really like the final look for the sky but felt like it needed a little somethin', somethin' so I added gold ink splotches which I love. I stamped my sentiment and put the card together then added good Pretty Pink Posh sequins. Lawn Fawn Summer 2016 release! I love me some Lawn Fawn! 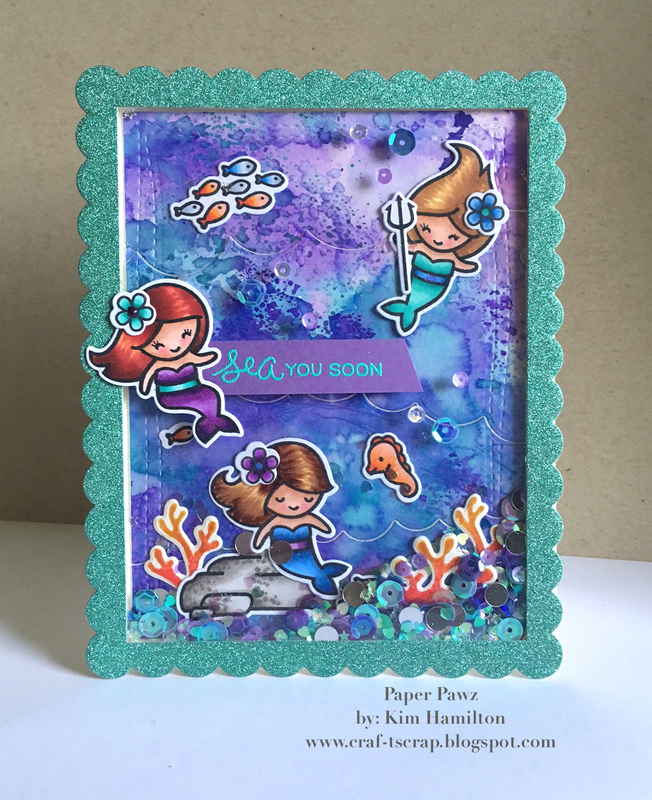 I could not resist playing with these mermaids!!! I started with a Canson Watercolor panel with a mix of Wilted Violet, Peacock Feathers, Mermaid Lagoon and Salty Ocean Distress Inks. I put the ink directly on my Ranger Craft Mat sprayed water generously and saturated my panel. I let it dry and repeated the process four times until I was happy with the final result. 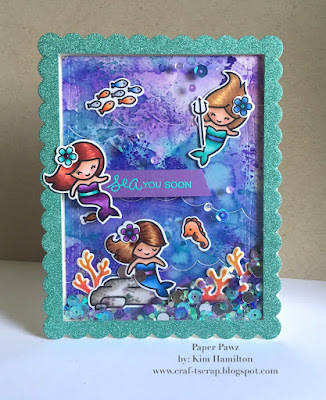 I stamped my images from Mermaid for You and the flowers from Stinkin' Cute (for the mermaids hair) on Neena 80lbs so I could Copic colour. I really wanted to practice colouring hair and these were perfect to find my own highlight spots! For the coral, I stamped with a mix of Abandoned Coral and Fossilized Amber also on the Canson Watercolor paper. I wanted a shaker card for this one so I used a mix of Pretty Pink Posh sequins and placed a few more on the top of the acetate. Happy Friday! It's time for another CAS-UAL Fridays Challenge! This week is all about the Birthday Boy for CFC148. I always have a hard time with masculine cards and I love having a stash of them between my husband and I we have six nephews three brothers/brothers-in-law etc... Big ol' family! 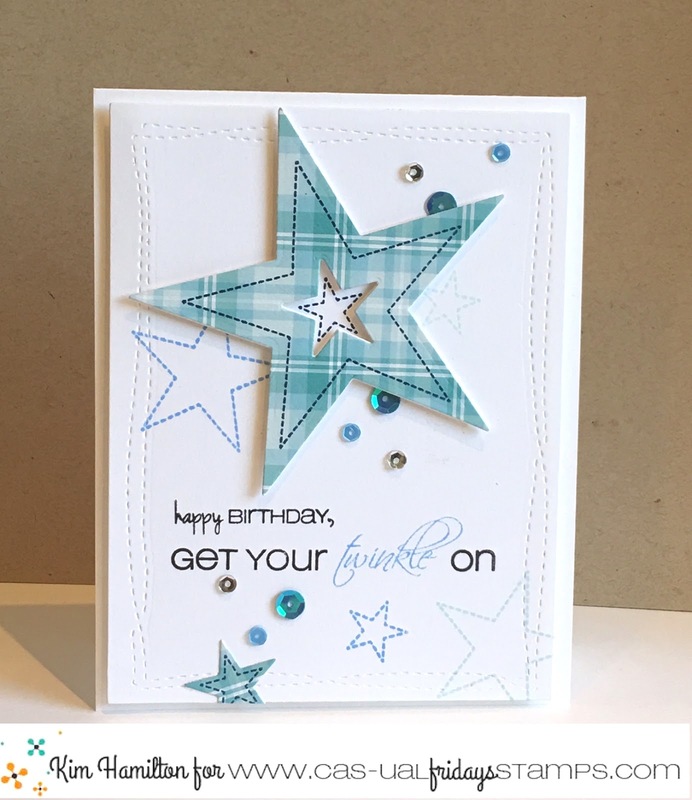 I just love these stars and they work perfectly for a birthday boy! 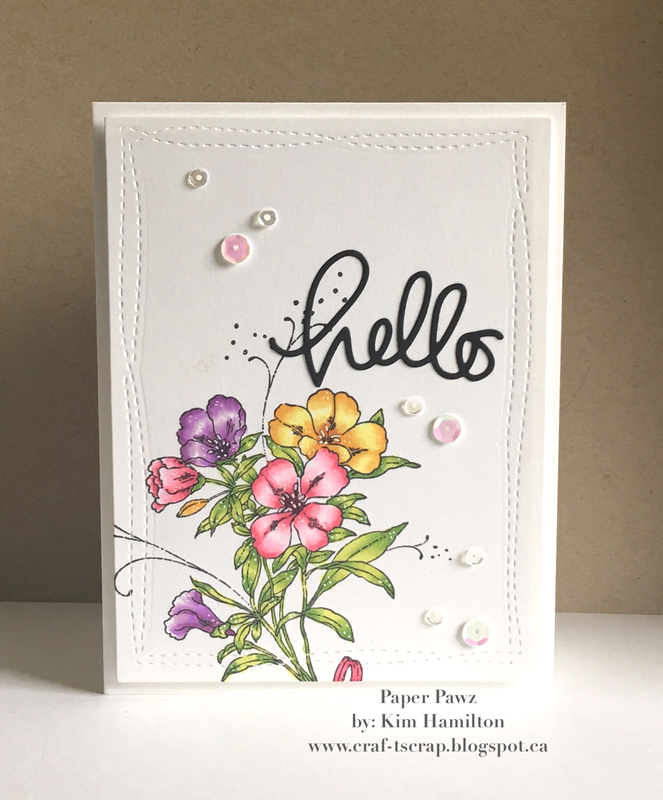 Quick post today sharing once again the Penny Black Blooming Garden stamp set that I seem to turn to ALL. THE. TIME. Lol! This is a wedding anniversary card for a special lady. I did the no-line Copic colouring for this one with RV10, RV13 and RV14 for the pink then YG01, YG23 and YG17 for the stems. A little white gell pen detail and a simple sentiment (the happy anniversary is stamped on the inside). I really like the clean and simple look of this one letting the flowers be the star! 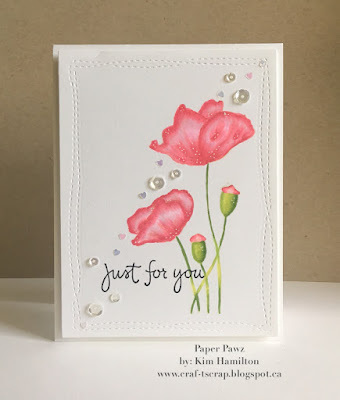 I simply love Penny Black flowers, there is just something about them that makes me want to reach for them regularly. Here is a new one that I picked-up over the weekend at my Scrapbook store, Scrapbook Centrale. The bouquet is Penny Black's Elegance in Motion #40-440. I used my Misti to be able to double stamp my MFT Black Hybrid ink and to place the stamp on an angle. I picked some Copic markers and used a "flicking" motion to be able to have the white space in the centre of the petals and leaves. The "Hello" die is by Simon Says Stamp, the Wonky Frame die is by Avery Elle (cut from Neena Solar White 80lb cardstock) I then added some sequins...surprise! Don't know what I did before sequins!! A quick post today with a card for a friend that was evacuated from Fort Mac, Alberta last week. Forest fires are common in most parts of Canada and Quebec (where I am from is no exception). However, in my time here, none have been nearly as catastrophic as what they are feeling in Northern Alberta right now. As soon as I have a forwarding address for her, this is going in the mail. I started by die cutting a Canson Watercolor paper frame from the Lawn Fawn large stitched rectangle (size of an A2 card) then grabbed the largest puffy cloud die also by Lawn Fawn. I blended Twisted Citron, Cracked Pistachio and Mermaid Lagoon Distress Inks. I then spread Perfect Pearls with a large soft paint brush while it was still fresh then sprayed my panel with water and blotted the excess. I used the Simon Says Stamp partial die cut florals I backed them with black cardstock so the flowers would really pop nicely. 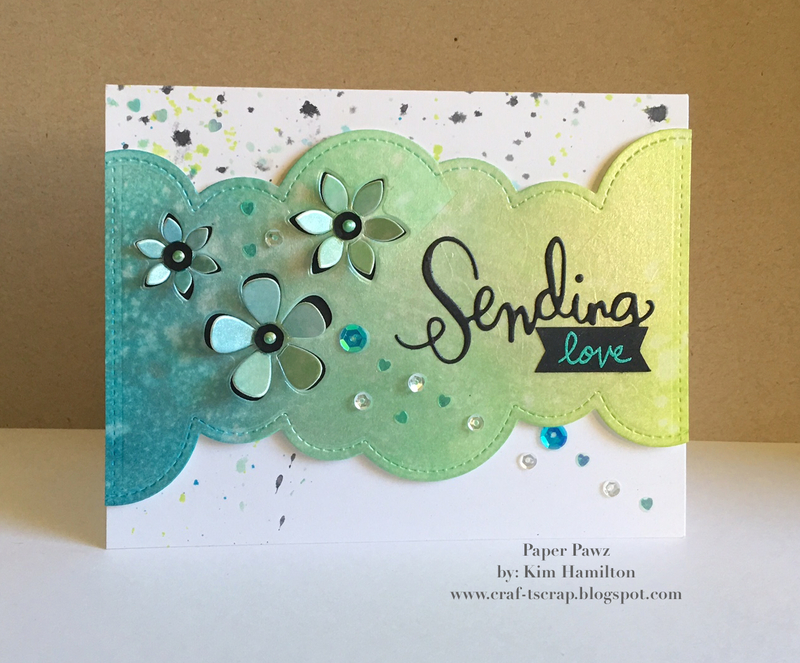 I put a small section of the black cardstock on Elizabeth Crafts two sided tape and die cut the delicate Sending die also from Simon Says Stamp. This makes it easy to keep the sentiment in the die and simply place it and use my paper piercer to place the die on my panel. The love sentiment is an oldie but a goodie also by Lawn Fawn (Sophie's Sentiments). I mixed the various Distress Inks with water with the addition of the Black Soot and flicked paint splotches on my Neena 110lb card base. I used foam tape for the panel and topped everything off with a mix of sequins. 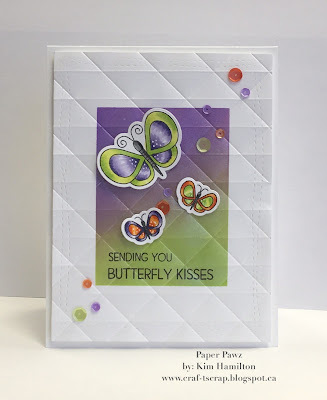 I started with Canson Watercolor paper and die cut my base panel and pattern paper (Lawn Fawn) with an MFT die. I took the inside panel and used Distress Inks in Spun Sugar, Picked Raspberry and Abandoned Coral in an "ombré" gradient. I used my distress sprayer then removed the excess water which gives that fun spotted effect. 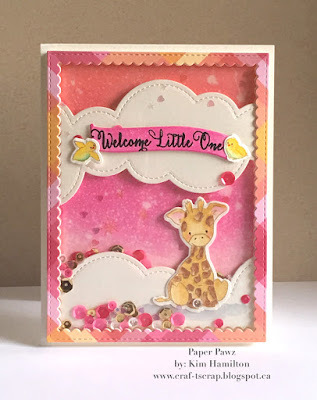 I then die cut a second inner panel for the clouds (Lawn Fawn) and I used the leftover to stamp my giraffe and birds from the Wplus9 Party Animal stamp set. To watercolor my images I used the Prima Tropicals set (new to me but I am addicted!). I put the card together with a mix of PPP and Martha Stewart sequins. I die cut the sentiment banner from the same paper and used Picked Raspberry and the sentiment is from Avery Elle Story Book. CAS-ual Fridays Challenge is back! The CAS-ual Fridays Challenge is back! I am so very happy to be one of the design team members! The challenge this week is CFC147- Birthday Girl! For my project I used the CAS-ual Fridays WallFlower and WTF stamp sets and the 4-petal Fri-Dies! I stamped my flowers using Versafine Black ink then die cut them with the Fri-dies. I used Tim Holts Distress inks for the flowers in Picked Raspberry, Abandoned Coral and Fossilized Amber. I also stamped my sentiments in Versafine Black ink and the Birthday was stamped in SSS Doll Pink. I topped everything off with a mix of sequins! What are you playing for? 10 winning entries will be highlighted on the CAS-ual Fridays blog each Thursday before a new challenge is set to go live the next day. 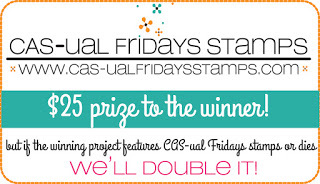 In addition, Michele has generously offered up a $25 gift certificate to the overall winner at CAS-ual Friday stamps. And if that weren't enough, if the chosen winner has used CAS-ual Friday stamps and/or dies as the main focus in the card, that gift certificate will increase to $50. Check out the CAS-ual Fridays Challenge blog for more inspiration and the enter! Happy hump day! 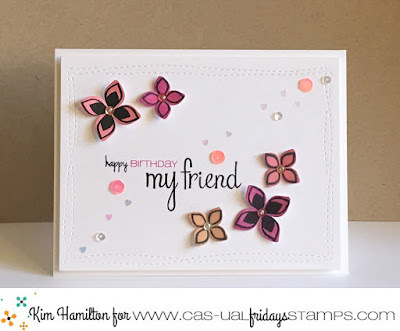 For today's card share, I thought it fitting to share a card I made with CAS-ual Fridays stamps! 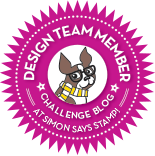 I am so very excited to be a part of the CAS-ual Fridays Challenge design team for the next six months. I have loved this Challenge for a number of years. I actually cut the rainbow stamp! Yes, but clear stamps are fantastic to easily line-up if you choose to go that route. It was easier to use with a rainbow variety of inks! I used SSS Doll Pink, Momento Luxe for the Orange, MFT hybrid Yellow, HA Green Hills and SSS Spring Rain. The stitched clouds are by Lawn Fawn and then I finished off with a few of the single butterflies in the same inks and Pretty Pink Posh sequins. 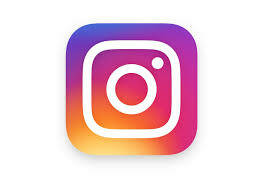 I just love the color palette from this weeks MFT Color Challenge! Makes me very anxious for summer! I used the Fly-by Friends set with matching dies! Love that set :) I die cut my Neena Panel with a Wonky Stitched Rectangle and I masked a rectangle. I used Twisted Citron and Wilted Violet and I brushed on Perfect Pearls (not very visible in the picture but the sheen is fantastic). I embossed with one of my We R Memory Keepers next level embossing folder (love them!). My butterflies are coloured with Copics and a little white gell pen for detail. I finished it off with PPP sequins!